‘Women starting businesses’ is now a movement, with more of us beginning the journey everyday. If you are part of this tribe of entrepreneurs, Congratulations on making it this far! Now is the time to put on your thinking cap, and think about the road ahead. Take a day off from your routine at work, and let’s get together to see how we can all Step Above. Whom is this event for? This is a “workshop-plus” event meant for women entrepreneurs already running a business, as well as women at the early stage, just starting a business. Here are some questions to help you decide. Are you keen to grow your business and revenues faster? Would it help you to talk to other women juggling similiar issues as they grow their ventures? Would you like to hear from entrepreneurs who’ve grown past the hurdles to growth? 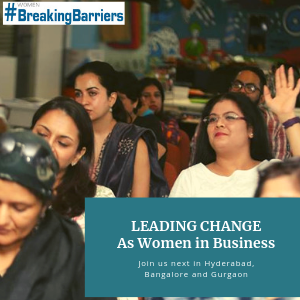 If you answered ‘Yes!’ to those questions, Welcome to the ‘Breaking The Barriers To Business Growth’ workshop-plus event, meant to help business owners, freelancers, consultants as well as women looking to start and grow their own businesses. #1 Find inspiration and information from coaches who work extensively with small business owners, know their challenges and will talk about the way forward. #3 Build your network – find partners, co-workers, customers, and suppliers; build alliances to propel your growth. #4 Go back armed with resources to keep you thinking and working on your growth plan. Plus, one of the best reasons to attend an event of this nature is simply to be a part of the supportive community called Women’s Web, and enjoy yourself in this nurturing environment! This event is being supported by Payumoney, which also allows us to handle registrations and ticketing for this event. From small businesses to firms with large transactions, Payumoney offers easy solutions to start selling and collecting your payments online with ease.